NETWORK UPDATE: There were 0.1 increases for THE BIG BANG THEORY and the 2 1/2 MEN finale in final numbers. THE ODD COUPLE stayed where it was, but it was very steady throughout its half-hour (up 0.1 at 8:45PM), which is a promising sign. In addition, SCANDAL and HOW TO GET AWAY WITH MURDER had 0.1 boosts. There were no changes for NBC, FOX or CW. The season premiere of VIKINGS (History) topped Thursday cable at 0.97, which compares to 1.34 for the February 2014 season premiere. 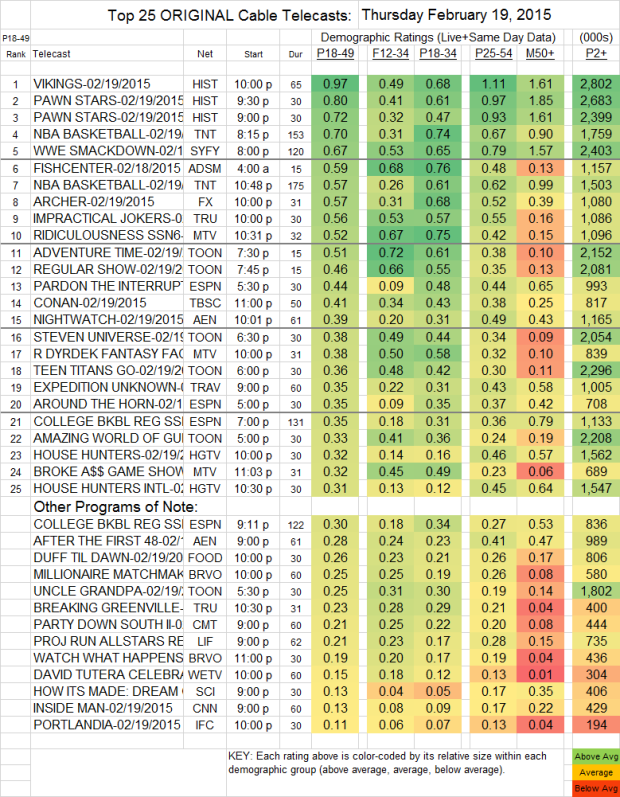 Its lead-in PAWN STARS was at 0.80/0.72, up more than a tenth from last week. TNT’s NBA BASKETBALL doubleheader was at 0.70/0.57. WWE (Syfy) lost a tenth to 0.67, while FISHCENTER (Adult Swim) gained a tenth to 0.59. ARCHER (FX) was up 0.14 to 0.57. On MTV, RIDICULOUSNESS gained a tenth to 0.52, ROB DRYDEK FANTASY FACTORY remained at 0.38, and BIG A$$ GAME SHOW was up 0.04 to 0.32. A&E’s AFTER THE FIRST 48 was at 0.29, and NIGHTWATCH dropped 0.16 to 0.39. MILLIONAIRE MATCHMAKER (Bravo) rose 0.09 to 0.25. BREAKING GREENVILLE (Tru) was also up 0.09 to 0.23. PORTLANDIA (IFC) edged up 0.02 to 0.11. A VERY BARRY BRANSON (GAC) was up from last week, but still microscopic at 0.004, with 68K total viewers.